A unique bath support combined with an extra-long bath mat in two stylish designs to provide additional support at bath time. This great bath support is full of useful features. 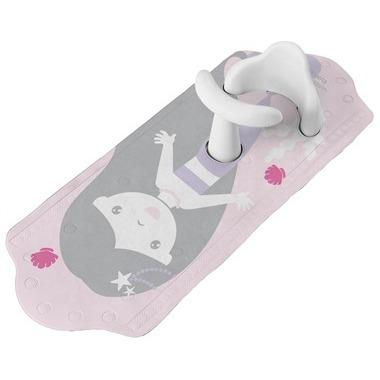 The t bar and shaped back support helps your baby sit up safely without slipping around and the long length of the bath mat allows a toddler to be bathed at the same time. A 'hot spot' feature on the mat gives a quick indication of when the water is too hot. Love this! Exactly what we needed to Bathe our 2 year and 7 month old children! Would recommend. This is exactly what I was looking for. It is safe, sturdy and perfect for bath time. Secures tightly to the bottom of the tub with several auctions. Amazing , great support but not restricting . My 10 month old loves it ! Fantastic product. Makes bath time with 2 kids much easier and safer. We had been trying to find something basically like a Bumbo for the bath for a while when I spotted this (and on sale too!). My daughter LOVES this! She gets the bit of support she needs for sitting, plus she can still reach a bit and move around for toys. I love that it snaps down to the bath (PS: has to be wet for this). PLUS it has the heat-sensitive shells. It's great, love it, very happy with this product. Love this bath mat! My 6 month old (who can sit up on her own- important*) loves to splash in the tub and this mat has helped her stay seated in place without me having to hold on to her. Perfect if you have a toddler too. I am able to give both my kids a bath at the same time and wash my toddler without worrying that my baby will slip and fall over. Just a note that if your tub has nonslip bumps, the suctions under the mat won't work so the mat will float. Works best on smooth bathtub surfaces.